Pacific white-sided dolphins travel in close-knit pods, and have been observed caring for sick or injured individuals. Like all members of the genus Lagenorhynchus, the Pacific white-sided dolphin is stocky with a short, very thick snout. The area at the tip of the snout, or "lips", are black. The most distinctive feature of this species is a prominent, strongly recurved and bi-colored dorsal fin. The dark grey back and sides are separated from the white belly by a black border. Light grey streaks starting at the sides of the melon (the bulbous forehead of many dolphins, porpoises, and whales) curve downward behind the eye and enlarge into grey thoracic patches. Grey "suspender stripes", start above the eye and widen into bands on the sides of the tail stock. Their large flippers are slightly rounded at the tips. Individuals may reach 200 kilograms (440 pounds) in weight and may be up to 2.5 meters (seven feet) in length, with males being slightly larger than females. They breed and calve spring-summer, sometimes early fall. After a 10-12 month gestation period, a single calf is born which may be up to three feet long and weigh up to 14 pounds. Females will reach sexual maturity around five to six years, and males around eight to 10 years. Males and females travel in pods, exhibiting a polygynous mating system, with one dominant male who will breed with available females. The Pacific white-sided dolphin eats a variety of small schooling fish, such as anchovies and hake, as well as squid. There is evidence that these dolphins feed mostly on midwater concentrations of marine animals known as the "deep scattering layer," and sometimes use cooperative foraging techniques. They are also often seen at dawn or dusk feeding with gulls on small surfacing balls of unidentified bait fish. Seasonal movements are not very well understood in most areas. Off the California coast, there appear to be resident groups that are joined by influxes of animals from other areas during the fall through spring. 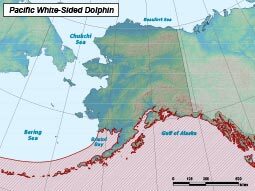 In the summer, animals may travel as far north as Kodiak Island, and dolphins have been seen in the Aleutians and the Gulf of Alaska. Whether these individuals are members of the local North Pacific stock, or have migrated in from the California/Oregon/ Washington stock, is unclear. Pacific white-sided dolphins are very sociable and often seen traveling in multi-species herds of ten to several thousand animals. Most commonly they are found in groups of several hundred animals. Typically these groups contain all age classes and both sexes. They are fast swimmers, common bowriders, and very playful and acrobatic. They are often seen leaping, flipping, and somersaulting. These gregarious cetaceans often are observed in the company of many other marine mammals, most notably, the northern right whale dolphin. Pacific white-sided dolphins (Lagenorhynchus obliquidens) inhabit temperate waters of the North Pacific Ocean and some neighboring seas. 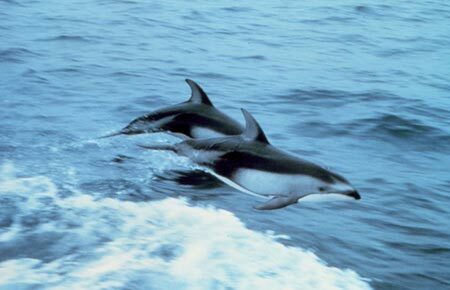 Despite their distribution largely in deep, offshore waters, Pacific white-sided dolphins also are found over the continental shelf and very near shore in some areas. While population structure is poorly understood for this species, they are managed as two distinct stocks: the California/Oregon/Washington stock, and the North Pacific stock (north of 45° N, including Alaska). Their southern range limits are near the mouth of the Gulf of California and Taiwan. The northern extent of their range extends into the Gulf of Alaska and west to Amchitka Island in the Aleutians. Dolphins are found rarely in the southern Bering Sea. The most complete population abundance estimate, from 1987–1990 line-transect surveys, is 931,000 and most likely reflects a range-wide estimate. This estimate does not take into account the two management stocks, thus a more reasonable estimate for the North Pacific stock, is approximately 26,880. Currently there is no reliable information on trends in the abundance of Pacific white-sided dolphins. Thousands of dolphins were killed annually as non-target species during high seas fisheries between 1978 and 1991; however, these fisheries are no longer in operation. In recent years (2000–2004), there has been no reported mortalities incidental to commercial fisheries in Alaska. In the western Pacific, hundreds or thousands of Pacific White-Sided Dolphins are killed each year in Japanese fisheries. Currently there are no reports of subsistence take by Alaska natives. Deep offshore waters, and occasionally the continental shelf of temperate waters of the North Pacific Ocean and some neighboring seas.